Practice examinations are very useful tools to prepare for board certification examinations. 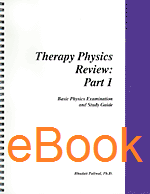 Therapy Physics Review: Part 1 is specifically designed to provide a realistic simulation of a written board examination for residents, dosimetrists, and therapists in radiation therapy. This study guide contains more than 150 practice questions with answers and explanations. Page references to standard texts in the field are included alongside the answers, providing an opportunity for further study in areas requiring more knowledge .The major topics covered are: Basic Physics Principles (such as structure of matter, radioactivity, and radiation quantities/units), Radiation Detectors, and Principles of Operation of Treatment Machines. This is an all-important aid in studying for board certification. If you have bought our Raphex practice exams, you will find this book to be of similar value.